← 1/16th of the way there! Things at work have been… a bit hectic to say the least. And it’s not even month end, let alone year end! But since we’ve got one person off on holiday and another who is sick, I’ve been given quite a bit of extra work to get through. So when I came home today, seeing two packages waiting for me was very very awesome and made my day a lot better. 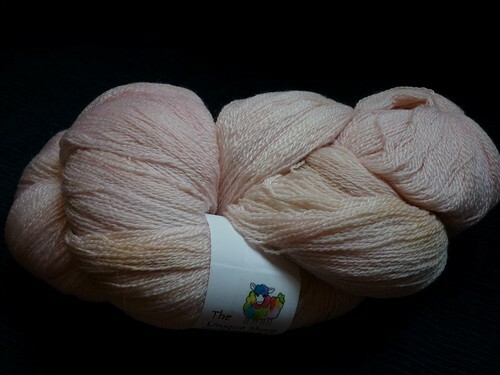 The first one was a skein of Eos in Blushing Bride. See how pretty it is? That’ll definitely turn into a shawl once I can get someone to wind it for me (there is no way that I’m doing that by hand!). And the second? Sip N Stitch! 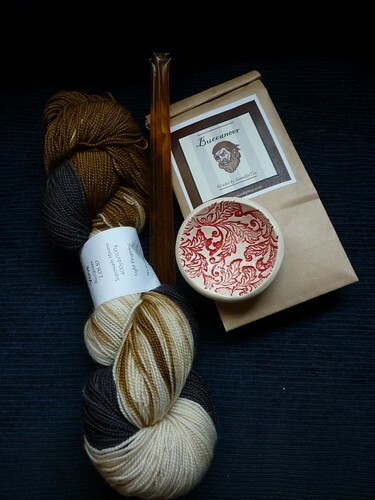 Since I was in the coffee club, I received a handmade tea bag holder instead of a mug. And those sticks? That’s honey. I can’t wait to try out the tea. 😀 And that yarn is just begging to become socks. Not sure which ones yet, but it definitely wants to be socks.